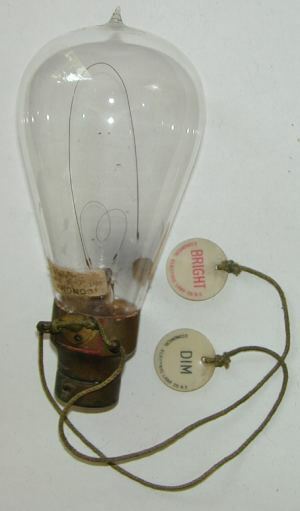 This is a very rare and early pip top dual switched filament carbon lightbulb. The bulb is made by The Economical Electric Lamp Company of New York and carries a label with US patent dates of 1902 and 1908, a separate label mentions a UK patent of 1902. One filament gives 16 c.p. and the other 1 c.p. and has a cord operated switch to select the 'Dim' or 'Bright' filaments. 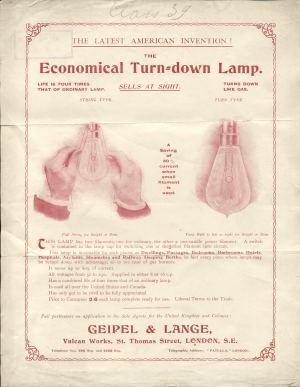 These rare English advertising leaflets, dated 1904 and 1909, from Geipel & Lange advertising light bulbs made by The Economical Electric Lamp Company of New York. 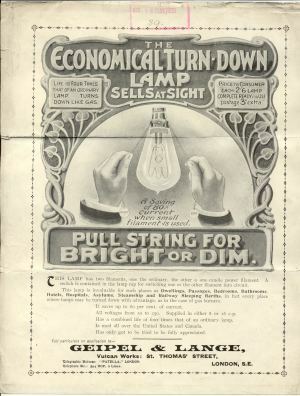 The bulb advertised has two separate carbon filaments and has a switch to select the 'Dim' or 'Bright' filaments. Life is four times that of an ordinary lamp. Sells at sight. Turns down like Gas. A Saving of 80% current when small filament is used. Leaflet shows two switch types - 'String Type': Pull string for Bright or Dim, and 'Turn Type': Turn bulb to left or right for Bright or Dim.. This lamp has two filaments, one the ordinary, the other a one-candle power filament. A switch is contained in the lamp cap for switching one or the other filament into circuit. This lamp is invaluable for such places as Dwellings, Passages, Bedrooms, Bathrooms. Hotels, Hospitals, Asylums, Steamship and Railway Sleeping Berths, in fact every place where lamps may be turned down with advantage, as in the case of gas burners. It saves up to 80 per cent. of current. All voltages from 50 to 250. Supplied in either 8 or 16 c.p. Has a a combined life of four times that of an ordinary lamp. Is used all over the United States and Canada. Has only got to be tried to be fully appreciated. Price to Consumer 2/6 each lamp complete ready for use. Liberal Terms to the Trade. Life is four times that of an ordinary lamp. Turns down like Gas. Price to Consumer each 2/6 lamp complete ready for use postage 3D extra.